Tel Aviv, Israel, July 23, 2018. In Q2/2018 Israeli high-tech companies raised $1.61 billion in 170 deals. The $300 million raised by Landa Digital Printing captured 19% of the total amount in Q2/2018. 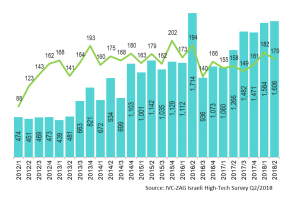 Israeli high-tech companies raised an all-time record amount of $3.2 billion in H1/2018—higher than the annual total capital raised in 2010–2013. Excluding the Landa financing round, the overall amount raised in H1/2018 is still the highest since the beginning of the decade. According to IVC findings, in Q2/2018, 94 VC-backed deals accounted for 55% of the total number of deals. The capital raised in VC-backed deals totalled $841 million. Non-VC-backed capital raising reached $765 million. Due to the Landa financing round, the capital share of the non-VC-backed rounds soared to 48% of the total capital raised, higher compared to the historical quarterly benchmark. Following a remarkable first quarter for A rounds companies, $200 million was raised in 39 deals in Q2/2018. Medium range rounds (B and C) attracted $857 million in 47 deals, 53% percent of the total capital raised. The C round increase was the result of the large round by Landa ($300m). Excluding this deal, the amount raised in C round decreased dramatically to $117 million. The notable increase in total capital raised by B rounds was attributable to several high-value deals as well as the increase in number of transactions. According to IVC, companies with revenues (initial revenue and revenue growth levels) accounted for $1.3 billion (81%) of all the capital raised in this period. Adv. Shmulik Zysman, managing partner at Zysman, Aharoni, Gayer & Co. (ZAG-S&W), says: "The trend of growth in investments in Israeli high-tech continues to stand out. After a particularly strong first quarter, the amount of capital raised in Q2/2018 continues to rise. With the exception of the Q2/2016, this quarter represents the most successful quarter in the last six years. We are also seeing an increase in capital raised from foreign investors. In our opinion, this growth is also due to an increase in investments from China, as well as from European investors who are interested, among other things, in automotive technology." Zysman added: "This quarter, along with a certain decline in the volume of investment in companies in the early maturity stages (Seed and R&D) compared to the previous quarter, we saw the continued increase in the amount of investment in late stage companies. Our optimism continues at the start of the second half of the year. Following the breaking of records in Q1, the amounts of capital raised in Q2/2018 increased. We expect these trends to continue, both in terms of capital raising and foreign investors entering into the Israeli high-tech industry." After a year of steep declines in early stage deals, IVC data indicates the trend is changing—186 early stage deals (seed and A rounds) were counted by end of H1/2018. The number of early stage deals peaked in 2016 at 384 transactions before dropping nearly 18% in 2017. If the capital raising activity will continue in the same levels, 2018 forecasted to end as a good year for early stage capital raising. Marianna Shapira, research director at IVC Research Center presented analysis of investors: "Since 2012, the number of investors involved in the Israeli high-tech market, has grown exponentially, reaching a peak in 2017. In H1/2018 the number has already reached 60% of this number". According to Shapira: "IVC findings showed that 65% of the investors in H1/2018 were VC funds and corporate investors. The number of investment companies has also increased over the past four years. Lately, we have seen a wider variety of investors actively taking part in the Israeli high-tech industry, enlarging their portfolios with innovative Israeli companies. Israeli startups have never enjoyed such a vibrant and diverse investor community as it is right now." Life science companies have lately attracted more attention in the Israeli high-tech industry. In Q2/2018, life science deals amounted to $267 million in 39 deals. The capital raised by life science companies decreased slightly compared to the previous and corresponding last year’s quarter. Software companies led capital raising in Q2/2018 with $584 million in 65 transactions, 36% of the total capital raised in Q2/2018. Looking at the industry verticals, artificial intelligence (AI) companies headed the leading verticals in Q2/2018, raising $426 million in 45 deals. Cyber security capital raising remained high with 30 deals accounting for $394 million. In Q2/2018, the number of cyber security deals in B round peaked, and attracted most of the capital, soaring to 62% of all capital raised by cyber companies. As a result, the cyber vertical contributed to the notable rise of B round amounts. Both IoT ($214 million) and fintech ($150 million) capital raising slowed down this quarter, following a hefty Q1/2018. This Survey reviews capital raised by Israeli high-tech companies from Israeli and foreign venture capital funds as well as other investors, such as investment companies, corporate investors, incubators and angels. The Survey is based on reports from 408 investors of which 59 were Israeli VC management companies and 349 were other entities. The term R&D companies refers to high-tech companies in the process of development and not yet offering products to the market. The survey covered total capital raised in Israeli high-tech sector, including VC-backed rounds, where at least one VC fund participated in the round, as well as deals not backed by venture capital funds. The survey includes amounts received by each company directly and does not count direct transactions performed between company shareholders. Each company belongs to more than one cluster, therefore the data regarding clusters should be viewed separately per cluster. For more on our methodology, please click here. IVC Research Center is the leading online provider of data and analyses on Israel's high-tech, venture capital, and private equity industries. Its information is used by all key decision-makers, strategic and financial investors, government agencies, and academic and research institutions in Israel. IVC-Online Database (ivc-online.com) showcases over 8,000 Israeli technology startups, and includes information on private companies, investors, venture capital and private equity funds, angel groups, incubators, accelerators, investment firms, professional service providers, investments, financings, exits, acquisitions, founders, key executives, and R&D centers. Publications include newsletters; Daily Alerts; the IVC Magazine; surveys; research papers and reports; and interactive dashboards. IVC Industry Analytics – analysis, research and insights into the status, main trends, and opportunities related to exits, investments, investors, sectors, and stages. ZAG-S&W (Zysman, Aharoni, Gayer & Co.) is an international law firm with offices in Israel, the United States, China, and the United Kingdom. The firm's attorneys specialize in all disciplines of commercial law for both publicly held and private companies, with particular expertise in high-tech, life sciences, international transactions, and capital markets. ZAG-S&W provides result-driven legal and business advice to its clients, addressing all aspects of the clients' business activities, including penetration into new markets in strategic locations. In recent years, the firm has acted on a majority of the equity and debt financing transactions by Israeli technology companies on the NASDAQ. It has been the firm's experience that the best results, those that give our clients the competitive advantage they need, are attained by coupling professional experience, global presence, and connections with the investor communities in Israel and abroad.